ALL OF THE MOLDS ARE BUILT AND THE MOLDING OF THE LURES IS BEING DONE IN THE UNITED STATES OF AMERICA!!! Formerly made of wood, the wood construction has now been changed over in favor of a solid high impact plastic design. The Slammer action remains the same but the consistency and durability has been outstanding! Molded in thru wire construction. The custom bent wire forms are place into the mold cavity and the bait is then injected, molding in the wire from. Being a solid bait, they can not leak, crack or fill up with water. Paint holds on the bait and the clear coat protects it forever. While the wood Slammers caught fish for years, keeping paint on wet wood has always been a problem. Now with the new plastic, this is no longer an issue! The baits come out of the mold within 1 gram of each other. The baits run more consistent and track truer at higher trolling speeds. No longer will the baits become water logged and change the lures buoyancy and action. While molding the baits, the slot for the plastic diving bill is molded in. A locating tab is molded into the slot that lines up the diving bill. This ensures better alignment when assembling the baits. Also, on the deep diving Slammers, it helps lock the lip in with the wire form. 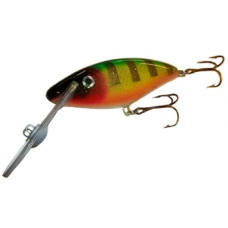 Minnow Baits: These have been the mainstay in the Slammer line since the beginning. The action and running depth stayed the same as the wood Slammers with the exception of a slower rise from the bait. This has been a huge plus when fishing in the cooler water during the spring and fall. 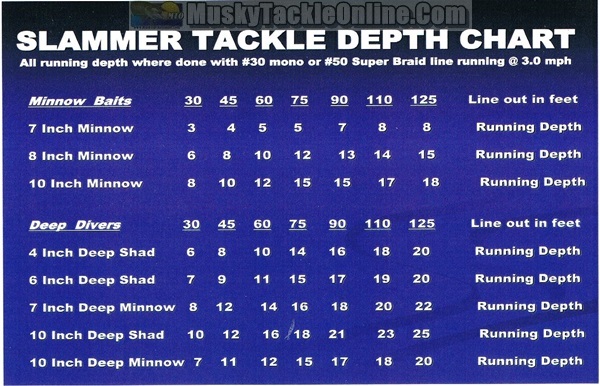 If you like to twitch them or troll them, Slammers line of Minnow baits have been catching fish since 1989. Deep Divers: The consistency of the plastic allows the baits to run truer at higher speeds. With the molded in lip slot the plastic diving bill fits securely in place and will not loosen up even when the bait makes bottom contact. This little guy is ideal for "twitching" or is still just as deadly on a straight retrieve. The perf..
An all around favorite size minnowbait in the Slammer line up. Perfect for spring and fall twitching.. If trophy fish are what your are looking for, then the 8 inch Slammer should be your first choice. D..
A large profile makes this a top choice for casting or trolling with its super wide wobble and side ..
Slammers 12" minnow is what you need if big fish are what your after. At 12 inches long and 6-1/2 ou..
New from Slammer Tackle in 2014 is the 5" Shad. Great for casting or trolling. Runs down 4 to 5 feet..
Slammer's 10" Shallow Shad is an awesome bait when Trolled and can reach depths of 12 feet. Easy pul.. If smaller bait is what you're looking for, then the 4" Slammer Deep Shad is a must for your tackle ..
A new look to a already great little bait, the popular shad/panfish shaped body has been added to th.. The slender profile of the 7 inch Deep Minnow matches baitfish like Perch, Walleyes, Suckers and Cis.. The 10 inch Shad deep diver has a large shad body profile makes this a sure hit for any trophy hunte.. If big fish are what you're after then Slammer's new 10 inch deep Minnow is the bait you need! Teste..